Troy Norman and Jay Samsal came across the biggest threats to their lead, did a 180-degree turn, and pointed their bow elsewhere. It wasn’t a sign of fear but respect. And by the end of the day Saturday, their integrity—along with fantastic fishing skills—were rewarded handsomely. 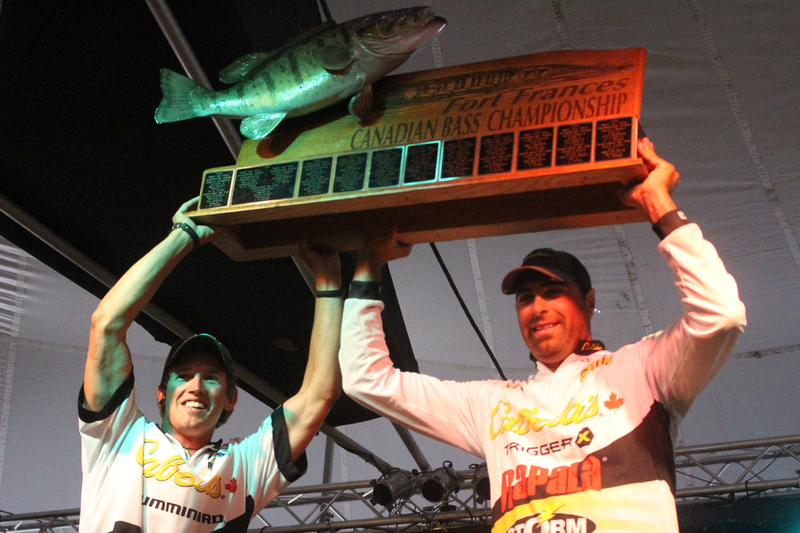 For just the fourth time in 22 years, the top team at the Fort Frances Canadian Bass Championship had a Fort Frances flavour to it as Norman teamed up with Kenora’s Samsal to capture the 99-team event for the first time with a 53.42-pound total. to share first prize of $20,000. “It’s so sweet,” beamed Norman, who along with Samsal went from having the lowest-recorded weight in the tournament in their first attempt in 2006 to being the best of the bunch on their 11th try. Just before rolling through the tent at the Sorting Gap Marina, Norman and Samsal were paid a heartfelt on-stage tribute by Mike Luhman (Deer Park, Wis.), who finished second with partner Mark Raveling (Longville, Mn.) by only .87 pounds (52.55). “We were fishing and another boat came towards where we were, and it was [Norman and Samsal],” recounted Luhman, who won the FFCBC with Raveling in 2012 but now has finished second four times and third one other occasion. “They were about half-a-mile away when they realized it was us and, right away, they turned around and headed the other direction,” he added. Norman and Samsal, who finished 33rd last year, sat 12th after Day 1 on Thursday with a mark of 16.19 pounds. The tandem really got rolling on Day 2, with the day’s third-best bag (18.64) vaulting them into the lead. Then they kept it going Saturday with the second-best weight (18.59) to seal the deal. “This tournament is all about good decision-making,” Samsal replied when asked what was the team’s key to victory. Five-time FFCBC champs Joe Thrun (Annandale, Mn.) and Jim Moynagh (Carver, Mn.) nearly made it six after shrugging off a difficult Day 1 (11.86). They bounced back with the biggest one-day bag of anyone in the tournament (20.70) on Friday to put themselves right in the hunt. They were strong again Saturday, but their total of 17.96 pounds wasn’t quite enough to put them over the hump as they settled for third place (50.52). Bryan Gustafson of Fort Frances and Kenora’s Brian McNanney landed in fourth spot (49.80) while the Kenora duo of Dean Smith and Jim Gustafson jumped from outside the top 10 to end up fifth (48.68) after snaring Saturday’s biggest five-fish haul (19.18). Day 1 leaders Bill Godin (Devlin) and three-time champ Dave Lindsay (Kenora) wound up in sixth place (48.53), with Brandon Kamm of Fort Frances and Atikokan’s Aaron Wiens finishing as the top rookie team in seventh (48.21). Richard Rud and Jon Austen of International Falls, the 2011 co-champs, captured eighth place (47.40) while 2013-14 title-holders Jeff Gustafson (Kenora) and John Peterson (Bemidji) landed in ninth (47.11). Kenora’s Connor Burton and Jeff Engstrom (46.95) rounded out the top 10 for the second-straight year. Raveling and Luhman’s lunker of 4.91 pounds on Friday was tied by Thrun and Moynagh on Saturday for the biggest fish of the tournament. As for the inaugural Can-Am Challenge, Team U.S.A. easily won bragging rights over their Canadian neighbours by a score of 240.87-173.03 pounds. The Americans were buoyed by having three of their five teams (Raveling-Luhman, Thrun-Moynagh, and Rud-Austen) finishing in the top 10. Meanwhile, three of the five Canadian teams (Denis Barnard/Scott Gobeil, Rene/Morgan Cadene, Nick Vescio/Mitch Siciliano) didn’t turn up to weigh in on Day 3 to seal their squad’s fate.